I've found it!!!! I found the triforce about a week ago and I took the picture on Friday. But I will keep the secret because it was hard for me to find it, but is was also great to find the clue that lead me to it. Please give me full credit for this, In about a month I will say where it is and how to get it. Ariana almandoz ( Kotake )"
Ok I'm sending the picture again, I have no idea why you couldn't get it. I'm very nervous I really want to be the first official triforce finder!!! Please, give me the credits,this is real, If I can I'll try to take more pictures. Unfortunatelly my sister made a mistake and saved the game where she shouldn't and now the only way to get the triforce again is playing from the beginning. This screenshot is what we've been looking for in the last weeks!!! On saturday I was talking to Goldenboy7 and I told him that I wanted something that could prove that you can actually get the triforce. What a coincidence! on Sunday Ariana sent this amazing picture. This screenshot is unbelievable. Ultima 9999 told me that it could be a screenshot from a Beta version of Zelda. I doubt it since I have never seen this picture before. 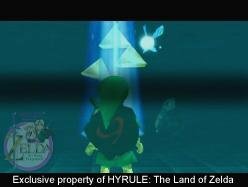 The only early screenshots that shows Link getting the Triforce are very well known for everybody , and has nothing to do with this picture. The only simmilarity I can find is the floor texture. Something that called my attention and also Wolfhang's is the fact that it is young Link who is standing there and not adult as most people suggested. I tried to analize this picture. I made different close-ups. It's difficult to say at first sight wether it's real or not. Especially is we consider the picture quality, its a bit low. I assume that the picture was taken with a regular camera. She didn't say anything about though. Ariana, I will need to interview you dear. You'll not escape from me!!! Also impressive is the prescence of other characters. This one is undoubtely RAURU the Sage. The elements that we can see in the picture make sense. At the moment I can't see anything that can lead me to think that this picture is false. I mean, look at this!!! We have three characters, the triforce (In a position I have never seen before), we have light sources and textures, I mean we have what looks like a screenshot of the game! and the graphics are of the same style as we can see in the game. Something that makes me think that this is real is the imperfections of the picture. 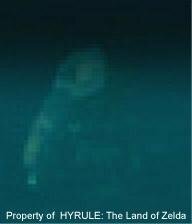 It is clear that it was not taken in the best conditions. But she did a great job anyway. It could have been worst. First of all, I want to tell Falco-X that my email account will explode with emails!!! I didn't tell you to show it to the people. Ok, never mind. As I can't answer every email I receive I will answer most of the questions in this, and other future emails. Some people believe that I invented this to get fame. Ok I didn't invent anything, but I do want to be famous!!! WANT A HINT? THE ONLY TEMPLE RELATED TO IT IS THE TEMPLE OF TIME!!!! You need a new melody. wouldn't have any value for me. I'll reveal how to get the triforce soon but not now. and don't spam!!!! I will not answer most of the emails. Ok Ariana, If you want to play let's play then. I like this. I'll follow your game. If this is true you have a job in this site. If you lie, then ... you'll get in serious trouble. Hola Falco, soy yo Ariana. Asi que hablas espa�ol tu tambien? pero mejor hablo en ingles asi me entienden todos estos que se creen los verdaderos due�os de la verdad. First of all I want to say that I'm really upset with most of the people who think that the picture I took is a fake, some sort of photo composition or something like that. Thats why because youre all losers, sorry to say this but you don't have the guts to go and find it for yourself, you need my help. And this guy that claims to have found it before me... C'mon boy, you just want me to reveal the secret. And I will never reveal it unless you treat me with the respect I deserve. I found it and I deserve something, maybe Nintendo should give me a prize or at least a disscount for the next game. And you still believe that Dark Link has something to do with this!!!! DARK LINK? Something else... it is not DARUNIA, its RAURU the SAGE WHO KEPT THE TRIFORCE SAFE FROM EVIL MINDS INSIDE THE TEMPLE OF LIGHT!!!!!! WHICH IS SEALED THANKS TO THE TEMPLE OF TIME!!!!!! Unfortunatelly, Link opened the seal and Ganondorf entered the sacred realm....BUT.... if you can skip this step you can GET INSIDE THE TEMPLE OF LIGHT AND SEE THE TRIFORCE FLYING IN FRONT OF YOUR EYES. STEP 1) first of all you should know that KAEPORA GAEBORA is RAURU incarnated. The OWL is RAURU helping you at the beginning of the game. If you want to know from where I get this information go to the SACRED FOREST MEADOW at the LOST WOODS and talk to the two GOSSIP STONES in there. They don't say that RAURU is the OWL , but they suggests this theory, and in fact RAURU IS KAEPORA GAEBORA. STEP 3) SOMEWEHERE, SOMETIME, KAEPORA GAEBORA ( that is RAURU) will teach you a song. A song that you MUST LEARN ( Like the Scarecrow song) , so write it down on a paper or try to remember it. OF COURSE, you MUST LEARN the song in the game , therefore nothing will happen if you play the OCARINA, so don't be fool and say that the melody doesn't work. STEP 4) Ok, now this is pretty simple, go to the TEMPLE OF TIME BEFORE YOU GET THE SWORD. IF YOU GET THE SWORD AND BECAME AN ADULT THEN THIS WILL NEVER WORK. STAND IN FRONT OF THE MASTERSWORD ( don't get it please!!!!!! ) 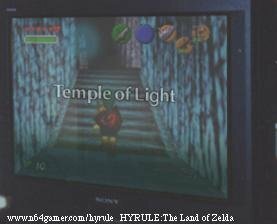 and play the "Overture of Sages"
STEP 5) Just watch the Cinema display showing Link travelling to the TEMPLE OF LIGHT. If you followed the story you'll see that this time you'll not be sealed inside the temple just as the regular way. And therefore Ganondorf will not be able to get the triforce because the SEAL IS STILL INTACT because you DIDN'T MOVE THE SWORD. NEXT STEPS) RAURU will talk and talk about you, him, Hyrule, The triforce and so on. He will ask you if you want to see the sacred relic ( its very funny to see the different dialogues, so don't worry, say no, say yes.... eventually he will show it to you inside a dark room or something like that. Rauru stands in front of you. The camera moves to an angle from behind Link. Rauru will move his arms and a hole will open in the ceiling. You'll see a light beam. The Room will turn blue. And one by one the triforces will come out from the hole and will get together. Then theres a rotation of the camera around the whole scene. You can even see the triforce from behind and inside the triangle that is formed you can see Link looking at it. YOU CAN'T ACTUALLY GET THE TRIFORCE, YOU CAN ONLY WATCH IT FOR ABOUT THREE MINUTES, NO MORE. So as you can see it was not that difficult. You don't need to do stupid and silly quests like exploding the gossip stones or talking to Dark Link... Or that GLITCH in the wasteland that everybody thinks is a temple!!!!! And let me say something If you don't like Link's cap then go complain with Nintendo. Link is looking up to the triforce, the angle is different as the one in the actual game. Also, its not easy to take a picture to a screen, I was luky that its possible to see the triforce. I think I did a great job taking that picture. But if you need more, well give me sometime, I have to play the game again. But as youre SOOOO smart, I'm sure that everybody will find it before I can take more pictures. Gracias FalcoX por la oportunidad que me das, realmente te lo agradezco mucho, y gracias por creer en mi. No gracias, no quiero ser miembro del staff. A proposito tengo varios dibujos que quiero mandarles para el Fan art, asi que si me lo permites te los mando pronto ok? Its me Ariana again. Boys you can't imagine, I have hundreds of emails, I don't have time to read them all! So don't expect any answer from me. Ok you wanted them I'm sending them, two pictures I took yesterday. One is when Kaepora teaches you the song, the other is a shot from the entrance to the temple of light. By the way sorry about this but I forgot the step 6 the other day,after you travel you actually walk through the temple of light after watching the first part of the cinema but is really short. Its like a maze, not a big one but as you don't have a map it turns to be a bit difficult. Not big deal just follow the right way , find Rauru and watch the next part of the sequence. and I REPEAT.... THE TRIFORCE DOES NOT APPEAR IN THE STATUS SCREEN OK? I'm not affraid of anyone, I have the truth in my hands, therefore I have nothing to be affraid of. I know this is true, I know I'm not a liar, I know I'm a woman, I know I have something in my head , I know all these guys that email me saying that I'm a liar are envious, I know, I know, I ****** Know how to see the triforce and I will prove all of you that I was the first player ( W-O-M-A-N ) to find the sacred relic!!!! Because I know this secret is gold REAL GOLD!!! and if Nintendo denies this is because they don't want this to be known, why? well I have no idea. but maybe they didn't want this to be known until they have sold all the copies they wanted. see you next time babys. I'll send you a pictures of mine soon!!! Tengan paciencia, ya les dije que les dire dentro de un mes!!!! ja ja ja!!!!!!!!!!! One picture from theTemple of Light, the Temple of the legend, the Temple where Rauru is protecting the Triforce. And a picture that doesn't need any sort of explanation. I wrote Ariana yesterday, and I asked her about the new pictures. It was not an interview!!! Falco-X: 1) Pretty amazing Ariana, your new pictures kicks serious butts. The one of the Temple of light is the most incredible screenshot I have ever seen. And the other, the one of the Overture of Sages looks convincing, except for one thing. I noticed that the sword is is in the right side, not in the left as it is supposed to be. So Ariana, how can you possibly explain that? Ariana: 1) You know, when I received your email I thought you were crazy or something like that. I also thought that you inverted the picture by mistake before putting it in the site. But obviously this is not the case, I looked at the picture again and you're right, The sword is in the right shoulder. Why? well I know nobody will believe my words but, I have no idea. I can't explain that. Falco-X: 2) Ariana, what do you want? an Oscar to the best performance? Maybe for best special effects? Now, I can't explain these things, I just took the pictures thats all. If the sword appears in his right side is not my fault. I think about this and I can't even believe myself!!!. 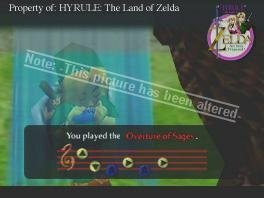 I don't know, for some reason something is not right here, maybe it was a glitch, maybe the song has some weird effects on Link that I couldn't figure out before.I Don t know Falco. Now everybody will think I'm a liar. THis is making me mad sorry. I think I'll dissapear from the net for some time, I don't' want to receive more emails, I just dont care if people think I'm the first to find the (#####) triforce or I'm a liar, now its the same for me, and I'm sorry Falco-X but I think this will be the last time you'll all hear about me. I feel bad, for some reason. Falco-X: 3) Why ( if your story is real) would you like to keep it in secret ? Ariana: 3) I keep the story in secret because its the first time that something like this happened to me. But now, I guess I have no choice but to reveal all the steps right? WRONG. I feel terrible. Now, this goes for all the people that claims to have found the trifore before me. Go ahead, reveal YOUR secret, I don't want to be known anymore. I will not reveal anything else, I'm upset. Maybe in one month I will come back and tell the people what I know unless an hearthquake kills me first!!!! And please don't write anymore, I will not read my yahoo account. I have another, and this is over until I decide to come back. After reading her answers I decided to email her again and I asked a few more things. Falco-X:1) Ariana, you know that now you can only show the world that you're not a liar if you reveal the secret. Are you aware of that? What will you do? Ariana: 1)I know that my only way out is to tell all the steps, to reveal the secret and show the people that I've found it. Then they would be able to see that these "mistakes" are from the game, not from the pictures. Yes I will reveal all the steps. But as I said before I will tell you in a month, not before. Falco-X:2) Now I just want to know why you don't go to other sites? Why did you choose "Hyrule:TLoZ" and not the official site or other popular Zelda site. I mean, why don't you go out there and give your story to everybody? Ariana: 2) I said that I've been a fan of your site since the beginning. I like the staff and I knew you would treat me with respect (except for Wolfhang who has always been very proud of himself). From a reader: Just a few startling revelations I made. Check out the pics I've included. In the picture with the split captures, notice the INCREDIBLE similarity between the two links standing there. Definitely trashes the "the hat's too long theory", because the one on the left was actually taken from the game, but the fact that the two links are IDENTICAL throws the whole theory down the crapper. Ariana did some tricky cut and paste here with a blue filter over link, thus the fading. In the second picture: I just simply went in a made a few changes. Notice anything? Relatively easy to change the tune, if you'll notice. Looks nice, doesn't it? And that's only after about 15 minutes. Give me more time, and, well, who knows what I could do with these pictures. Sorry to burst everyone's bubble, but Ariana is a fraud. I'm developing more evidence right now. I'll keep you posted. Oh, yes same angle and everything. You've done good. One thing why's the Link on the left brighter than the one on the right? Well, the background is darker. -Amazing Job Ryan. You have found the original picture from where Link was taken from. Congratulations!!! Now, as everybody can see, it's not that difficult to play with photos. And it's not difficult to play with the people's innocence. You don't need a computer hooked to the N64 or the TV, you don't need an emulator or days of hard work. Just Photoshop and a bit of experience. Disclaimer: This post is VERY lengthy and covers a great number of aspects of Zelda 64. It jumps around quite a bit, but still has many points within it. I found this on www.zelda64.com, the OFFICIAL Zelda 64 site, run by Nintendo. "Ed" is an editor at Nintendo of America, Inc. To prove the below, go to www.zelda64.com and go to Hyrule News, then Letters to the Editor...and scroll down a bit. It's right there in plain view. "Ed: I too have read the many rumors on the web regarding the possible presence of the wonderful Triforce, and I can tell you that I wouldn't waste my time trying the outlandish things often recommended. A lot of sites claim to have inside information from NOA employees, but strangely enough no one I know has managed to find the Triforce! No one has ever been able to confirm collecting the Triforce. My best answer to your question is that it is impossible to get the Triforce. I consulted Zelda translator and Hyrulian expert Dan Owsen about this controversial matter, and he guaranteed me that he wrote no screen text for Link finding the Triforce. That's straight from the horse's mouth, folks." "Ed" the Editor (EDitor) also states that "Sheikah Stones (also called Gossip Stones) are wacky rocks that are basically only included in the game as a source of goofy entertainment. They don't have a purpose which alters the outcome of the game, but they sure did perplex me for a while." That should debunk any rumors of Sheikah Stones meaning anything. The above is from the 1/14/99 Letters to the Editor. I hope this clears everything up. As far we now know, there is NO way to attain the Triforce. If text scripts were never written on the attaining of the Triforce, then there isn't a way to get it. As for the morons who've been e-mailing huge posts about how to get it, they're obviously bs'ing (as you've thankfully figured out!). "Ed: What?? Zelda 64 finally hits the streets after an excruciating wait, and you're already biting your nails about a sequel? Actually, you're not the only impatient gamer who's inquired about the next Zelda game. The official response? So you can all stop wondering if you'll get the Triforce when the 64DD comes out...because obviously it won't matter, there isn't going to be another Zelda for a looooooong time. Shigeru Miyamoto said, in an official Press Release, that: "M: It would have been more convenient to have used the Memory Expansion Pak for Zelda, but it wasn't ready. " "Q: Does the Expansion Pak work with this game? A: The Legend of Zelda: Ocarina of Time was not programmed to use the Expansion Pak so playing the game using that accessory will have no effect. You can play the game with the Expansion Pak in the N64, but it will not affect the game play, graphics, etc. at all." "Ed: There is only one game. The official name is The Legend of Zelda: Ocarina of Time. We use Zelda 64 as a loving nickname. Whether your cartridge is gray, gold, or you've spray painted it blue, they all play the same." Ed also noted that, in the 1/8/99 Letters to the Editor of Hyrule News of www.zelda64.com, there is NO WAY IN HELL that Zora's Fountain will ever unfreeze. 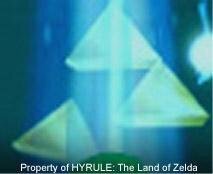 As for the retards at zelda@linkhouse.net, with their link "Find the Triforce!!! ", this is the same stupid poem that's been running around for weeks. I hate to say this, but this poem was NEVER released by ANY official member of Nintendo of America, Inc. Unlike many people who say this, I actually DO know someone who playtests games for NoA, Inc. Regardless of the fact that they are contracted to NOT divulge any secrets unless given express permission to do so, the poem is obviously b.s. The little brown things in the ceilings of the underground grottos are coconuts/nuts of some sort. You can shoot them down with arrows to reveal rupees, bombs, and other small treasures. Also, this poem states expressly that you can only find the THIRD force of Power. The Triforce of Wisdom is Zelda's, The Triforce of Courage is Link's (as he 'rescued' it from evil in The Adventure of Link), and the Triforce of Power is Ganon's. Except in Zelda 64, all of the characters already HAVE the Triforce, it was granted to them at birth (play the game and read the storyline instead of coming up with personal presumptions). (all of the above taken from "The Legend of Zelda: A Link to the Past" Nintendo Player's Guide). And, as we all know, Ganondorf uses the Triforce of Power to become Ganon, and takes it with him into hell, or wherever it is he takes off to. Please also note the dialect of the characters in Zelda 64. For the most part they speak in elongated rhyme and high diction (take, for example, olde english as high diction). All of the official Nintendo of America, Inc. "hints" have also been given in the same high standards. The poem on http://www.linkhouse.net/zelda64/index.htm is written in first grade vocabulary, grammar, and structure (even young Link would speak in Shakespearean sonnet, not a whole bunch of pansy couplets). "The Legend of Zelda: A Link to the Past" (after the Imprisoning War, when Ganondorf has expended a great deal of the Triforce of Power's power, and had to call on Agahnim). "The Legend of Zelda" (Hyrule's completely fallen apart, Impa is much older than she is in Zelda 64, Zelda herself is also older, and has the power to fragment the Triforce of Wisdom itself). "The Adventure of Link" (Impa is dying, the Hyrulians are starting to pull themselves back together and form small towns and villages, Ganon has been imprisoned at Link's own doing in "The Legend of Zelda" and can only summon evil but not work directly against Link). Ah well, I think I've written enough. In closing, I'd like to say that Zelda 64, even though it took me a long time (because I have a life), was well worth it. Sure, plenty of things could've been better, but focus on what was created: an epic tale of the beginnings of Hyrule. Mandrag Ganon, Ganon of the Enchanted Thieves. - I Can only thank you for bringing this report. It was necessary to put all these points together. Good Job! -Ariana is over as well as her unsupported story. The lack of truthfull evidence has obliged us to close the case for ever. So don't email us, our friends or even Ariana (or whoever she is) about this. It's over. If you still think that Ariana is telling the truth then you have nothing to do here. We�re sorry. And if you believe we�re rushing things, sorry to tell you but, we have better things to do now. Something happened, something I thougth would never happen, but it did. Ariana returned, Now please read what she says. Hi, Its me Ariana again. I returned as I promised. Well it was more than a month anyway but, here I am. I just want to explain step two. Yes you listened well, step two does exist. As I said before, step one was nothing else than an introduction to the quest. Now the moment has come. "ho please, Ariana please you are the Goddess please tell me". And then those silly little liars that tried to scare me saying that they knew all the steps and would show it to the world... of course nothing of that happened. Just lies, pathetic lies. And the people that didn't believe me; I don't hate them, I don't hate them at all. In fact I want to say that I respect peoples opinions, I respect what Falco-X said, what Wolfhang said, what Gamer-X said (although he was rude, and used my story without my permission) and many more like IGN64. My pictures looked faked for many people. They even said that the pic of the Temple of Light was Damp�s Graveyard!!! How can someone be so stupid, are they blind? show me that place in the game and I'll pay you. well well. Its now over. Step 2 is here, are you ready to read? -People from all over the world will try my story, they will swallow it like candies no matter that the pictures are a total fake, the mistakes I made in purpose were to show how silly can some people be. Some idiots will show proofs against the pictures, will try to show their knowledge in the usage of software like Photoshop and will prove me that they know nothing, (none really discovered how I made them) people will play play and play non stop and will not even sleep,everything just for me, ja ja ja, I'm still receiving emails !!!! I can't believe this. That is STEP 2. Satisfied? Now I want to thank the staff of this site ( THIS SITE NO OTHER OK?) for their attention, I had a good time laughing, and I want to give special thanks to the editor Falco-X for the section he put up just for my story although he probably knew that all this was just a lie almost since the beginning. And as many people thought, I'm not from Colombia. Maybe I'm not even a girl, but you'll never know. Now, yes, the case is closed, officially closed by the creator of this story. Stop writing emails, it's useless, I never read them and this was all a lie, if you didn't believe it then you're smart, If you believe it, then you probably need to grow up and shut your mouth up. Thanks H:TLOZ for everything, good bye. At last!!! You're back. Thanks for telling the truth,and as you said, case closed!!! Any doubt? Hyrule: The Land of Zelda - "The Legend of Zelda" is a registered trademark of Nintendo.